Kerala, in the southern tip of India is an enchantingly beautiful, emerald green sliver of land,nestled between the mesmerising Western Ghats on one side, the Arabian Sea on the other and strewn with rivers, lagoons, winding backwaters and lush green vegetation in between. In a nutshell, Kerala offers you nature on a platter with the sandy beaches of Kovalam, blue lagoons at Veli, the hill stations of Ponmudi and Munnar, the backwaters of Allepey and Quilon, plantations, magnificent mountain peaks, picturesque valleys, glorious festivals and stunningly beautiful temples all of which will make your escapade a truly rewarding and memorable one. To top it all, these charming destinations are easily accessible by a leisurely two hour drive from each other making it just the right place for you to be. 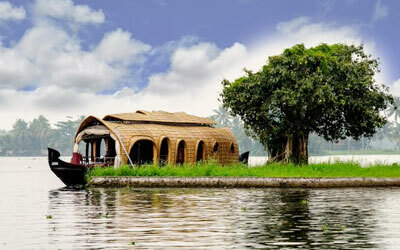 National Geographic recently chose Kerala as one of the 50 best destinations in the world! Clipper Holidays offers you a thrilling combination of Houseboat cruises, stay in backwater resorts ( with soothing ayurvedic massages on request! 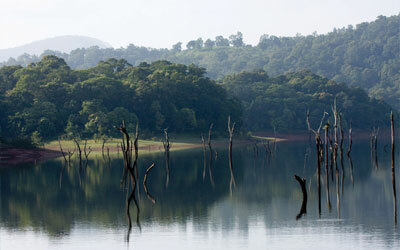 ), followed by a visit to Thekkady or Kovalam beach. The essence of Kerala is its swaying palms and glistening waterways which come together to create the magical web of the backwaters.Here time flows at a measured pace merging yesterday and tomorrow into an enchanting today. Clearly the best way to enjoy the tranquility of the backwaters is to hire a houseboat.You could drift away lazily along palm lined banks sipping coconut water,dining on succulent crabs, fresh fish,steamed idlis and freshly roasted bananas with the taste and consistency of baked custard until the light softens,the sun is low and gold and you realize you have drifted away into a dreamy evening!! 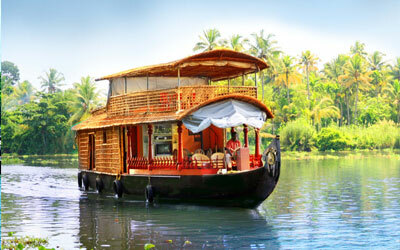 The boats in which you explore the gentle rhythms of the backwaters are traditionally called Kettuvallams. They are beautifully furnished, complete with a dining area,bedroom with an attached bath and a kitchen. a cook who doubles up as the captain with a 2 man crew. Thekkady, one of the world's most fascinating natural wildlife sanctuaries, where you can watch and photograph wildlife at handshaking distance from the safety of your boat. The vegetation, the flora and fauna and the birds of Thekkady are uniquely rich, vast and varied that it does not bear resemblance to any other wildlife sanctuary in the world.Even a casual visitor will not fail to observe the peculiar ecological pattern of Thekkady.Notable in Periyar are the majestic Asiatic wild elephant and the distinctive Nilgiri langur with an all black body and white face. Other creatures include wild boar, wild dog, bison, sloth bear, leopard and, even, tiger! Amongst the avifauna, the most profuse are herons, egrets, darters, kingfishers and the great Malabar Grey hornbill. 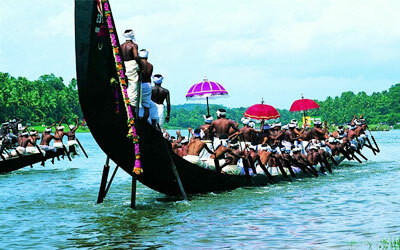 Alleppey really comes alive in the heights of the rainy season, when it serves as the venue for one of Kerala's major spectacles - the Nehru Trophy snake boat race - Second Saturday of August every year with magnificently decorated long boats, with raised sterns designed to resemble the hood of a cobra. More than enthusiastically powered by up to 150 singing and shouting oarsmen, scores of boats take part, and Alleppey is packed with thousands of spectators. Other events at Payippad and Aranmula also display the strength and rhythm of oarsmen who set the backwaters of Kerala on fire. 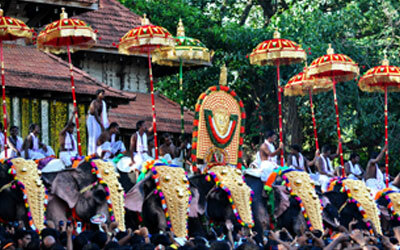 Thirty caparisoned elephants decorated with gold ornaments, each ridden by three Brahmins holding objects symbolizing royalty including colourful umbrellas, create a spectacular sight-especially when accompanied by Chenda Melam, the quintessentially music of Kerala. Lakhs of people throng to watch the Thrissur Pooram. April / May every year. 'Ayurveda’ means ‘the knowledge of life’. The origin of Ayurveda, the science of life, dates back more than 5,000 years. The Vedas, the first literature of human civilization are claimed to constitute the foundation of Ayurveda!. Ayurveda dictates the social norms of an individual. This helps in maintaining spiritual health and also elaborates on the daily routines, seasonal routines and changes these routines to suit, the region of the person belongs. Ayurveda has a separate branch called ‘Rasayana ‘ to maintain youth and vitality and to recover lost health in diseased conditions. In Ayurveda all treatments are aimed at building up the strength of the person which would help him to lead a healthy and happy life. It gives special emphasis on prevention of disease. 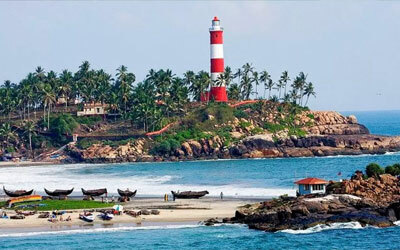 A beautiful, curving, palm fringed-beach of golden sands has made Kovalam a very popular destination in Kerala. It is located 15km from Trivandrum and offers a variety of hotels & resorts to suit every budget.